When the winter months really get into full force, there's only one way to combat the chapping and redness the deep chill leaves behind. Hand cream. 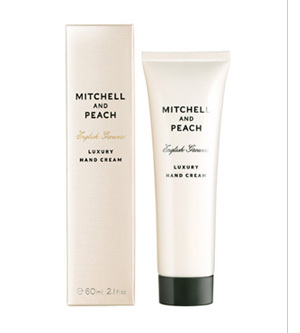 But not just any hand cream ... Mitchell and Peach Luxury Hand Cream. This delightful cream is presented in divinely luxe packaging. I love the white tube with black top and slender black writing -- it exudes such an air of rich panache. And the cream itself? Not only does it sink into skin immediately, leaving behind no greasy residue, but it makes skin feel so soft and smooth. A combination of Vitamin E, shea butter and English honey ensure that skin's suppleness is restored immediately. It's scented with ylang ylang, Palmarosa, roses, pure English lavender, sweet vanilla and violet -- a tranquil yet tantalizing scent that is somehow delicate, not overpowering. Mitchell and Peach Luxury Hand Cream retails for $32 at beautyhabit.com.